Chogha Zanbil is an ancient Elamite complex in the Khuzestan province of Iran. It is one of the few existent ziggurats outside of Mesopotamia. It lies approximately 42 km south-southeast of Dezful, 30 km south-east of Susa and 80 km north of Ahvaz. Chogha in Bakhtiari means “hill”. Choga Zanbil means ‘basket mound.’ It was built about 1250 BC by the king Untash-Napirisha, mainly to honor the great god Inshushinak. Its original name was Dur Untash, which means ‘town of Untash’, but it is unlikely that many people, besides priests and servants, ever lived there. The complex is protected by three concentric walls which define the main areas of the ‘town’. The inner area is wholly taken up with a great ziggurat dedicated to the main god, which was built over an earlier square temple with storage rooms also built by Untash-Napirisha. The middle area holds eleven temples for lesser gods. It is believed that twenty-two temples were originally planned, but the king died before they could be finished, and his successors discontinued the building work. In the outer area are royal palaces, a funerary palace containing five subterranean royal tombs. The main building materials in Chogha Zanbil were mud bricks and occasionally baked bricks. The monuments were decorated with glazed baked bricks, gypsum and ornaments of faïence and glass. Ornamenting the most important buildings were thousands of baked bricks bearing inscriptions with cuneiform characters. Glazed terracotta statues such as bulls and winged griffins guarded the entrances to the ziggurat. Near the temples of Kiririsha and Hishmitik-Ruhuratir, kilns were found that were probably used for the production of baked bricks and decorative materials. It is believed that the ziggurat was built in two stages. It took its multi-layered form in the second phase. 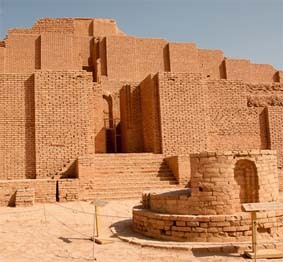 The ziggurat is considered to be the best preserved example in the world. [according to whom?] 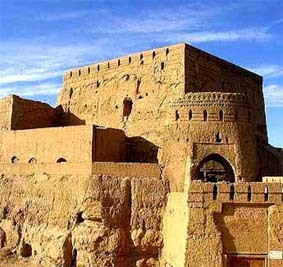 In 1979, Chogha Zanbil became the first Iranian site to be inscribed on the UNESCO World Heritage List. The Narin Qal’eh or Narin Castle is a mud-brick fort or castle in the town of Meybod, (North West of Shiraz) Iran. Structures like these constituted the government stronghold in some of the older towns of central Iran in pre-Islamic period. Some of these castles like the Nairn castle incorporate mud bricks dating to the Medes but most are from the Achaemenid and Sassanid periods. The ruins of the structure stands 40 meters high from its base. Although built probably between 2-3,000 years ago, it contains what seems to be a type of plumbing system made out of mortar built into its massive walls. 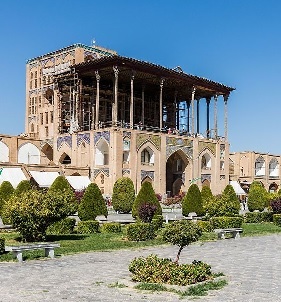 It is also peculiarly similar in design to Ali Qapu palace of Isfahan; it has a terrace high on top of the structure whose circulation is provided by two helical stairwells (whose walls have caved in, making it inaccessible). The structure also has a large underground chamber (filled now by rubble), possibly a prison. Four towers surround the entire compound, and a large gate furnishes access to a large courtyard. The structure seems to have been the victim of numerous earthquakes throughout the ages. The position of this city is unlike all others as you can watch over 70 kilometers in every direction from the top of the roof, yet again it is centered between mountains so for an invasion you had to climb those mountains first then go another 70 kilometres. Although all outer gates have been destroyed the inner castle still exists. You can still see some of the outer walls. The ancient Iron Age settlement known as Tepe Nush-e Jan can be found 50 kilometers south of modern Hamadan (ancient Ecbatana). It is described as a Median town, and perhaps rightly so. However, so far, it has been impossible to identify the objects that represent the Median state. The empire of the Medes is not an archaeological fact (yet), but exists only as something mentioned by other sources such as Herodotus. A possible explanation for this discrepancy is that the Medians remained nomadic, and that Herodotus has projected aspects of the Achaemenid Empire – a real, fully developed state – backwards. 5.a cross-shaped building that has been interpreted as a fire sanctuary – probably the oldest example of this type of building. A 14C-dating suggests that it was built in 723±220 BCE. Pasargadae was the capital of the Achaemenid Empire under Cyrus the Great who had issued its construction (559–530 BC); it was also the location of his tomb. It was a city in ancient Persia, located near the city of Shiraz (in Pasargad County), and is today an archaeological site and one of Iran’s UNESCO World Heritage Sites. Cyrus began building the capital in 546 BC or later; it was unfinished when he died in battle, in 530 or 529 BC. 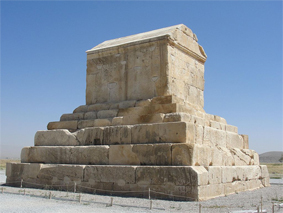 The remains of the tomb of Cyrus’ son and successor Cambyses II have been found in Pasargadae, near the fortress of Toll-e Takht, and identified in 2006. Pasargadae remained the capital of the Achaemenid empire until Cambyses II moved it to Susa; later, Darius founded another in Persepolis. The archaeological site covers 1.6 square kilometres and includes a structure commonly believed to be the mausoleum of Cyrus, the fortress of Toll-e Takht sitting on top of a nearby hill, and the remains of two royal palaces and gardens. Pasargadae Persian Gardens provide the earliest known example of the Persian chahar bagh, or fourfold garden design. The design of Cyrus’ tomb is credited to Mesopotamian or Elamite ziggurats, but the cella is usually attributed to Urartu tombs of an earlier period. In particular, the tomb at Pasargadae has almost exactly the same dimensions as the tomb of Alyattes II, father of the Lydian King Croesus; however, some have refused the claim (according to Herodotus, Croesus was spared by Cyrus during the conquest of Lydia, and became a member of Cyrus’ court). The main decoration on the tomb is a rosette design over the door within the gable. In general, the art and architecture found at Pasargadae exemplified the Persian synthesis of various traditions, drawing on precedents from Elam, Babylon, Assyria, and ancient Egypt, with the addition of some Anatolian influences. The palace and its Apadana were destroyed by fire during the reign of Artaxerxes I (465-424/423). Inscriptions proves that he almost finished restoring the palace; the apadana took longer and was not finished until the reign of his grandson Artaxerxes II Mnemon (404-358). The palace was usually entered from the east, where the visitors were welcomed at the Great Gate. Moving to the west, guests would pass along three or four courts. The Third Court was the largest: was larger than two first courts. It may have been used for military exercises. The Second Court is now easy to recognize because it looks much deeper than the other courts. The most famous building at Susa is probably the Apadana, the audience hall of the Palace of Darius. It was accessible from the south through the second and third courts. The hall measured 109×109 meter and had thirty-six large columns to support the roof. Three times twelve columns supported the roof of the porticos to the west, north, and east sides of the building. The apadana of Susa is larger than its counterpart in Persepolis. As with many places and people, the ancient capital of the Achaemenian kings of Persia is known to us by it’s Greek name “Persepolis” meaning Persian City. 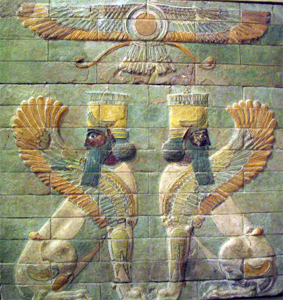 The Persians themselves called it “Parsa” meaning the city of Persians. The remains of Persepolis are located in the Fars region of what is now southwestern Iran.. It is now called “takht-e-jamshid”. Construction of the city was begun under Darius I (Darius the Great – reigned 522–486 B.C.). Persepolis was built in a remote and mountainous region which was quite inconvenient, making its function as the royal residence and seat of power, somewhat strange. Administration of the Achaemenian Empire was likely still carried on from the traditional power centers of Susa, Babylon, and Ecbatana. Upon the defeat of the Persian Empire by the Macedonian King Alexander the Great in 330 B.C. 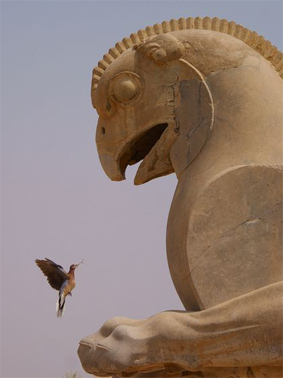 Persepolis was plundered, and the palace of the then Persian King Xerxes, was burned. According to one legend, it was Thais, a Athenian courtesan who traveled with the army of Alexander, that supposedly persuaded Alexander to set fire to the Achaemenian Palace. In another version, the fire was started when a drunken Thais led a revel that got out of hand. In any event, years later Persepolis was still the capital of Persia, but now as a province of the Macedonian empire. The city gradually declined, and then fell to ruin after the Seleucid period. Naqsh-e Rustam) “Rustam Relief”) is an ancient necropolis located about 12 km northwest of Persepolis, in Fars Province, Iran, with a group of ancient Iranian rock reliefs cut into the cliff, from both the Achaemenid and Sassanid periods. It lies a few hundred meters from Naqsh-e Rajab, with a further group of Sassanid reliefs. The oldest relief at Naqsh-e Rustam dates back to c. 1000 BC. Though it is severely damaged, it depicts a faint image of a man with unusual head-gear, and is thought to be Elamite in origin. The depiction is part of a larger mural, most of which was removed at the command of Bahram II. The man with the unusual cap gives the site its name, Naqsh-e Rustam (“Rustam Relief”), because the relief was locally believed to be a depiction of the mythical hero Rustam. 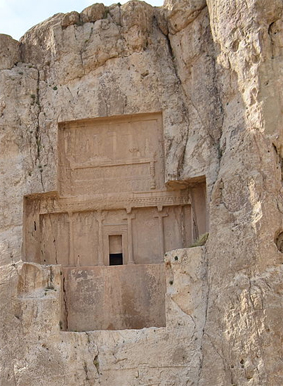 Four tombs belonging to Achaemenid kings are carved out of the rock face at a considerable height above the ground. The tombs are locally known as the Persian crosses, after the shape of the facades of the tombs. The entrance to each tomb is at the center of each cross, which opens onto to a small chamber, where the king lay in a sarcophagus. The horizontal beam of each of the tomb’s facades is believed to be a replica of a Persepolitan entrance. One of the tombs is explicitly identified, by an accompanying inscription, as the tomb of Darius I (c. 522-486 BC). The other three tombs are believed to be those of Xerxes I (c. 486-465 BC), Artaxerxes I (c. 465-424 BC), and Darius II (c. 423-404 BC) respectively. The order of the tombs in Naqsh-e Rustam follows (left to right): Darius II, Artaxerxes I, Darius I, Xerxes I. A fifth unfinished one might be that of Artaxerxes III, but is more likely that of Darius III (c. 336-330 BC), the last king of the Achaemenid Dynasts. The tombs were looted following the conquest of the Achaemenid Empire by Alexander the Great. Seven over-lifesized rock reliefs at Naqsh-e Rustam depict monarchs of the Sassanid period. The remains at Kangavar reveal an edifice that is Hellenistic in character, and yet display Persian architectural designs. The plinth’s enormous dimensions for example, which measure just over 200m on a side, and its megalithic foundations, which echo Achaemenid stone platforms, “constitute Persian elements”. This is thought to be corroborated by the “two lateral stairways that ascend the massive stone platform recalling Achaemenid traditions”, particularly that of the Apadana Palace at Persepolis. 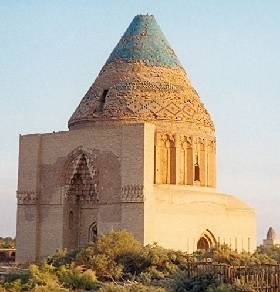 Another Iranian construction with Hellenistic characteristics is the Khurra mausoleum in Markazi Province. The Bam Citadel. 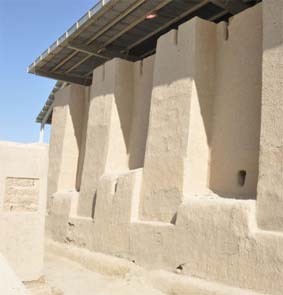 or Arg-e Bam was the largest adobe building in the world, located in Bam, a city in the Kermān Province of south eastern Iran. It is listed by UNESCO as part of the World Heritage Site “Bam and its Cultural Landscape”. The origin of this enormous citadel on the Silk Road can be traced back to the Achaemenid period (6th to 4th centuries BC) and even beyond. The heyday of the citadel was from the 7th to 11th centuries, being at the crossroads of important trade routes and known for the production of silk and cotton garments. 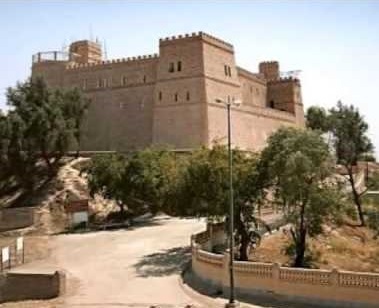 The entire building was a large fortress in whose heart the citadel itself was located, but because of the impressive look of the citadel, which forms the highest point, the entire fortress is named the Bam Citadel. On December 26, 2003, the Citadel was almost completely destroyed by an earthquake, along with much of the rest of Bam and its environs. 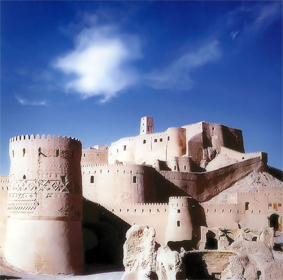 Larger than nearby Arg-é Rayen, the area of Bam Citadel is approximately 180,000 square meters (44 acres), and it is surrounded by gigantic walls 6–7 metres (20–23 ft) high and 1,815 metres (5,955 ft) long. The citadel features two of the “stay-awake towers” for which Bam is famed – there are as many as 67 such towers scattered across the ancient city of Bam. All buildings are made of non-baked clay bricks, i.e. adobes. Bam Citadel was probably, prior to the 2003 earthquake, the biggest adobe structure in the world. The Citadel was used as the major location site for Valerio Zurlini’s film of The Desert of the Tartars. Taq Kasra is a Sassanid-era Persian monument located near the modern town of Salman Pak, Iraq. 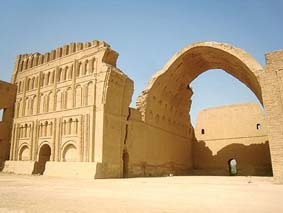 It is the only visible remaining structure of the ancient city of Ctesiphon. The archway is the largest single-span vault of unreinforced brickwork in the world. The exact time of construction is not known with certainty. Construction possibly began during the reign of Khosrau I after a campaign against the Byzantines in 540 AD. The arched iwan hall, open on the facade side, was about 37 meters high 26 meters across and 50 meters long, the largest man-made, free standing vault constructed until modern times. The arch was part of the imperial palace complex. The throne room—presumably under or behind the arch—was more than 30 m high and covered an area 24 m wide by 48 m long. The top of the arch is about 1 meter thick while the walls at the base are up to 7 meters thick. It is the largest vault ever constructed in the world. The catenary arch was built without centring. In order to make this possible a number of techniques were used. The bricks were laid about 18 degrees from the vertical which allowed them to be partially supported by the rear wall during construction. The quick drying cement used as mortar allowed the fresh bricks to be quickly supported by those that were previously laid. The Taq Kasra is now all that remains above ground of a city that was, for seven centuries—from the 2nd century BC to the 7th century AD—the main capital of the Iranian successor dynasties of the Parthians and Sassanids. The structure left today was the main portico of the audience hall of the Sassanids who maintained the same site chosen by the Parthians and for the same reason, namely proximity to the Roman Empire, whose expansionist aims could be better contained at the point of contact. The structure was captured by the Arabs in AD 637. They then used it as a mosque for a while until the area was gradually abandoned. The monument was in the process of being rebuilt by Saddam Hussein’s government in the course of the 1980s, when the fallen northern wing was partially rebuilt. All works, however, stopped after the 1991 Gulf War. The current Iraqi government is cooperating with the University of Chicago’s “Diyala Project” to restore the site. 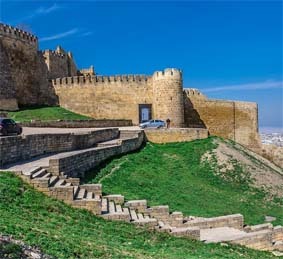 UNESCO’s classified the Derbent fortress as a World Heritage. The current fortification and walls were built by the Persian Sassanian Empire as a defensive structure against hostile nomadic people in the north, and continuously repaired or improved by later Arab, Mongol, Timurid, Shirvan and Iranian kingdoms until the early course of the 19th century, as long as its military function lasted. 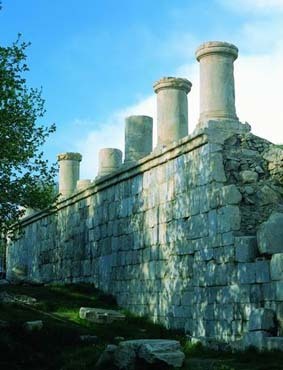 The fortress was built under direction of the Sassanid emperor Khosrow I. A large portion of the walls and several watchtowers still remain in reasonable shape. The walls, reaching to the sea, date from the 6th century, Sassanid dynasty period. The city has a well-preserved citadel (Narin-kala), enclosing an area of 4.5 hectares (11 acres), enclosed by strong walls. Historical attractions include the baths, the cisterns, the old cemeteries, the caravanserai, the 18th-century Khan’s mausoleum, as well as several mosques. The oldest mosque is the Juma Mosque, built over a 6th-century Christian basilica; it has a 15th-century madrassa. Other shrines include the 17th-century Kyrhlyar mosque, the Bala mosque and the 18th-century Chertebe mosque. 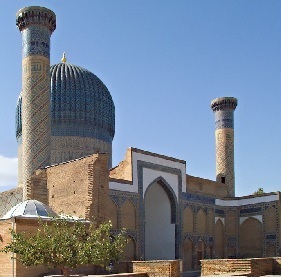 The Samanid mausoleum is located in a park just outside the historic urban center of Bukhara, Uzbekistan. The mausoleum is considered to be one of the most highly esteemed work of Central Asian architecture, and was built between 892 and 943 CE as the resting-place of Ismail Samani – a powerful and influential amir of the Samanid dynasty, one of the last native Persian dynasties that ruled in Central Asia in the 9th and 10th centuries, after the Samanids established virtual independence from the Abbasid Caliphate. 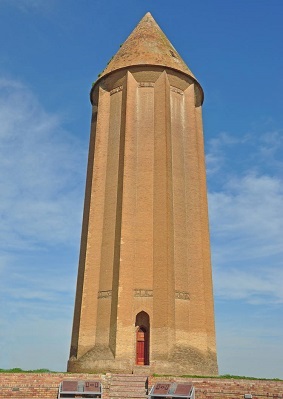 Gonbad-e Qabus tower is a monument in Gonbad-e Qabus, Iran, and a UNESCO World Heritage Site since 2012. The Tower in the central part of the city reaches 72 metres (236 ft). The baked-brick-built tower is an enormous decagon building with a conic roof, which forms the golden ratio Phi, that equals 1.618. 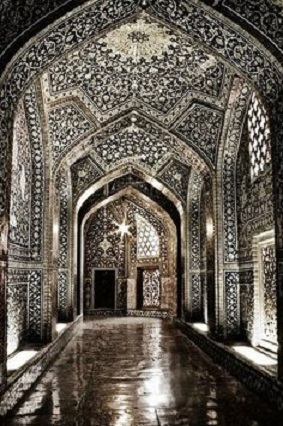 The interiors contain the earliest examples of Muqarnas decorative styles. The decagon with its 3 meter-thick wall, divided into 10 sides, has a diameter of 17 m. The Tower was built on such a scientific and architectural design that at the front of the Tower, at an external circle, one can hear one’s echo. 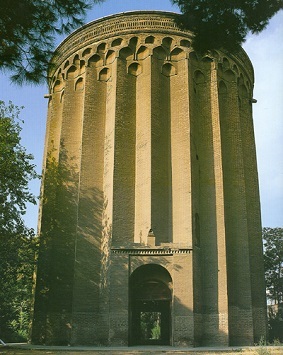 Tuğrul Tower (also transliterated Toghrul, Tughrol, or Tughrul) is a 12th-century monument, located in the city of Rey, Iran. Tuğrul Tower is near Rashkan Castle. The 20 meters tall brick tower is the tomb of Seljuk ruler Tuğrul Beg, who died in Rey in 1063. Originally, like other monuments of its time, it was capped by a conical dome, which collapsed during an earthquake. The thickness of the walls varies from 1.75 to 2.75 meters. The inner and outer diameters are 11 and 16 meters, respectively. The exterior shape is that of a polygon with 24 angles in its design, which is thought to contribute to the structure’s stability against tremors. The Kharraqan towers are mausoleums, built in 1067 and 1093, located on the plains in northern Iran, near Qazvin. The brick structures stand 15 metres (49 ft) tall and 4 metres (13 ft) wide, and make extensive use of geometry. Inside the older mausoleum there is a lamp and paintings. The eastern tower dates from 1067–68, while the western tower dates from 1093. Both towers appear to be the work of the architect, Muhammad bin Makki al-Zanjani. It is believed that the occupant of the eastern tower was Abu Sa’id Bijar and the occupant of the western tower was Abu Mansur Iltayti. These towers are remnant examples of architecture that existed during the Seljuk period of medieval Persia. 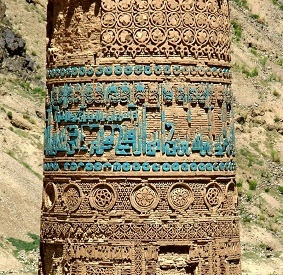 The Minaret of Jam is a UNESCO World Heritage Site in western Afghanistan. It is located in a remote and nearly inaccessible region of the Shahrak District, Ghor Province, next to the Hari River. The 62-metre (203 ft) high minaret was built around 1190 entirely of baked bricks and is famous for its intricate brick, stucco and glazed tile decoration, which consists of alternating bands of kufic and naskhi calligraphy, geometric patterns, and verses from the Qur’an. As of 2013 the minaret remained on the list of World Heritage in Danger, under serious threat of erosion, and was not actively being preserved. The circular minaret rests on an octagonal base; it had 2 wooden balconies and was topped by a lantern. Its formal presentation has a striking similarity to the minaret built by Masud III in Ghazni. It is thought to have been a direct inspiration for the Qutub Minar in Delhi, India, which was also built by the Ghurid Dynasty. After the Qutub Minar, the Minaret of Jam is the second-tallest brick minaret in the world. The Minaret of Jam belongs to a group of around 60 minarets and towers built between the 11th and the 13th centuries in Central Asia, Iran and Afghanistan, including the Kutlug Timur Minaret in Old Urgench (long considered the tallest of these still in existence) to the tower at Ghazni. The minarets are thought to have been built as symbols of Islam’s victory, while other towers were simply landmarks or watchtowers. This structure is the presumed Tomb of Sultan Ala al-din Tekesh, the founder of the Khwarezm Empire and its ruler between 1172-1200. The building is made of bricks and consists of a square hall with walls which are 11,45 meters high, a massive round drum and a conical roof with an inner dome hidden under it. The dome is connected to the square walls it rests upon by an octagonal belt. The structure between the dome and the octagon is decorated with 16 shallow niches. Their form is not lancet-like as those commonly found in the Islamic architecture of Central Asia, but rather semicircular. This is a motif that can be found in the marble 8th-century mihrab at the Baghdad Museum, and has seldom been used in Central Asia: another comparable case that can be found in Turkmenistan is that of the mihrab of Muhammad Ibn Zayd’s 11th-century mosque, from Merv. However, the two are located too far away to be considered prototypes. The external conical roof is built of horizontal layers using the technique of a false vault. From the inside, it is strengthened with 12 buttresses standing upon the internal dome. Although this might seem like a risky construction technique, the roof is not in bad condition: only the top is destroyed, and the blue majolica[disambiguation needed] decoration slightly damaged. One of the special features of the building’s architecture is its façade. It presents a high portal niche with the main archway, which has now lost its original form. Interestingly, the lancet arch of the portal is filled by a complicated system of stalactite -like forms, which is a decorative motif made of terracotta and fixed on wooden sticks within the brickwork. 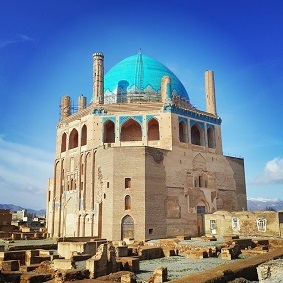 The central magnet of Soltaniyeh’s several ruins is the Mausoleum of Il-khan Öljeitü also known as Muhammad Khodabandeh, traditionally known as the Dome of Soltaniyeh in Soltaniyeh city, Zanjan Province. The Gūr-i Amīr is Persian for “Tomb of the King”. It is a mausoleum of the Asian conqueror Timur (also known as Tamerlane) in Samarkand, Uzbekistan. It occupies an important place in the history of Persian-Mongolian Architecture as the precursor and model for later great Mughal architecture tombs, including Gardens of Babur in Kabul, Humayun’s Tomb in Delhi and the Taj Mahal in Agra, built by Timur’s Persianised descendants, the ruling Mughal dynasty of North India. It has been heavily restored. This architectural complex with its azure dome contains the tombs of Tamerlane, his sons Shah Rukh and Miran Shah and grandsons Ulugh Beg and Muhammad Sultan. Also honoured with a place in the tomb is Timur’s teacher Sayyid Baraka. The earliest part of the complex was built at the end of the 14th century by the orders of Muhammad Sultan. Now only the foundations of the madrasah and khanaka, the entrance portal and a part of one of four minarets remains. The construction of the mausoleum itself began in 1403 after the sudden death of Muhammad Sultan, Tamerlane’s heir apparent and his beloved grandson, for whom it was intended. 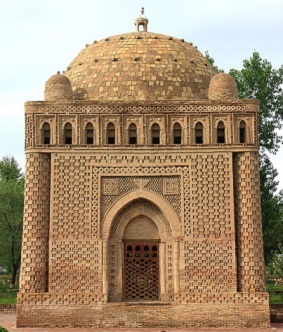 Timur had built himself a smaller tomb in Shahrisabz near his Ak-Saray palace. However, when Timur died in 1405 on campaign on his military expedition to China, the passes to Shahrisabz were snowed in, so he was buried here instead. Ulugh Beg, another grandson of Tamerlane, completed the work. During his reign the mausoleum became the family crypt of the Timurid Dynasty. The Bazaar of Tabriz is a historical market situated in the city center of Tabriz, Iran. It is one of the oldest bazaars in the Middle East and the largest covered bazaar in the world and is one of Iran’s UNESCO World Heritage Sites. Tabriz has been a place of cultural exchange since antiquity. Its historic bazaar complex is one of the most important commercial centres on the Silk Road. A bazaar has existed on the same site since the early periods of Iranian urbanism following Islam. Located in the center of the city of Tabriz, Iran, the structure consists of several sub-bazaars, such as Amir Bazaar (for gold and jewelry), Mozzafarieh (a carpet bazaar, sorted by knot size and type), shoe bazaar, and many other ones for various goods such as household items. The most prosperous time of Tabriz and its bazaar was in the 16th century when the town became the capital city of the Safavid kingdom. The city lost its status as a capital in the 17th century, but its bazaar has remained important as a commercial and economic center. Although numerous modern shops and malls have been established nowadays, Tabriz Bazaar has remained the economic heart of both the city and northwestern Iran. Sheikh Safi, a leader of an Islamic Sufi order established by the Safavids, was born in Ardabil. The Safavids valued the tomb-mosque form, and the tomb with its mausoleum and prayer hall is located at a right angle to the mosque. The buildings in the complex surround a small inner courtyard (31 by 16 meters). The complex is entered through a long garden. The Mausoleum was first built by his son Sheikh Sadr al-Dīn Mūsā, after Sheikh Safi’s death in 1334. It was constructed between the beginning of the 16th century and the end of the 18th century. 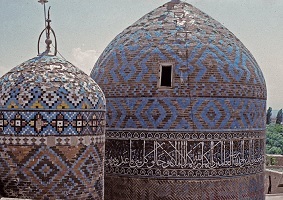 The mausoleum, a tall, domed circular tower decorated with blue tile and about 17 meters in height; beside it is the 17th-century Porcelain House preserving the sanctuary’s ceremonial wares. Also part of the complex are many sections that have served a variety of functions over the past centuries, including a library, a mosque, a school, mausolea, a cistern, a hospital, kitchens, a bakery, and some offices. It incorporates a route to reach the shrine of the sheikh divided into seven segments, which mirror the seven stages of Sufi mysticism. Various parts of the mausoleum are separated by eight gates, which represent the eight attitudes of Sufism. Several parts were gradually added to the main structure during the Safavid dynasty. A number of Safavid sheikhs and harems and victims of the Safavids’ battles, including the Battle of Chaldiran, have been buried at the site. Naqsh-e Jahan Square (trans: “Image of the World Square”), is a square situated at the center of Isfahan city, Iran. Constructed between 1598 and 1629, it is now an important historical site, and one of UNESCO’s World Heritage Sites. It is 160 metres (520 ft) wide by 560 metres (1,840 ft) long (an area of 89,600 square metres (964,000 sq ft)). It is also referred to as Shah Square or Imam Square. It is surrounded by buildings from the Safavid era. The Shah Mosque is situated on the south side of this square. On the west side is the Ali Qapu Palace. Sheikh Lotf Allah Mosque is situated on the eastern side of this square and at the northern side Keisaria gate opens into the Isfahan Grand Bazaar. In 1598, when Shah Abbas decided to move the capital of his rule from the north-western city of Qazvin to the central city of Isfahan, he initiated the complete remaking of the city. The chief architect of this colossal task of urban planning was Shaykh Bahai (Baha’ ad-Din al-`Amili), who focused the programme on two key features of Shah Abbas’s master plan: the Chahar Bagh avenue, flanked at either side by all the prominent institutions of the city, such as the residences of all foreign dignitaries, and the Naqsh-e Jahan Square. 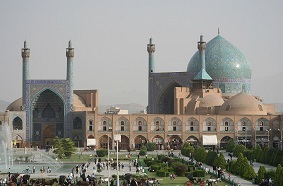 The ingenuity of the square, or Maidān, was that, by building it, Shah Abbas would gather the three main components of power in Persia in his own backyard; the power of the clergy, represented by the Masjed-e Shah, the power of the merchants, represented by the Imperial Bazaar, and of course, the power of the Shah himself, residing in the Ali Qapu Palace. Many historians have wondered about the peculiar orientation of the maidān which does not lie in alignment with Mecca. There maybe an explanation to this; the vision of Shaykh Bahai was for the mosque to be visible wherever in the maydān a person was situated. Had the axis of the maydān coincided with the axis of Mecca, the dome of the mosque would have been concealed from view by the towering entrance-portal leading to it. By creating an angle between them, the two parts of the building, the entrance-portal and the dome, are in perfect view for everyone within the square to admire. Ali Qapu is a grand palace in Isfahan, Iran. It is located on the western side of the Naqsh e Jahan Square, opposite to Sheikh Lotfollah Mosque, and had been originally designed as a vast portal. It is forty-eight meters high and there are six floors, each accessible by a spiral staircase. In the sixth floor, Music Hall, deep circular niches are found in the walls, having not only aesthetic value, but also acoustic. The name Ali Qapu, from Arabic “Ālī” (meaning “imperial” or “great”), and Turkic “Qāpū” (meaning “gate”), was given to this place as it was right at the entrance to the Safavid palaces which stretched from the Naqsh e Jahan Square to the Chahar Baq Boulevard. The building, another wonderful Safavid edifice, was built by decree of Shah Abbas I in the early seventeenth century. Shah Abbas, here for the first time, celebrated the Nowruz (Iranian New Year) of 1006 AH / 1597 C.E. Ali Qapu is rich in naturalistic wall paintings by Reza Abbasi, the court painter of Shah Abbas I, and his pupils. There are floral, animal, and bird motifs in his works. The highly ornamented doors and windows of the palace have almost all been pillaged. Only one window on the third floor has escaped the ravages of time. Ali Qapu was repaired and restored substantially during the reign of Shah Sultan Hussein, the last Safavid ruler, but fell into a dreadful state of dilapidation again during the short reign of invading Afghans. The Shah Mosque, also known as Jaame’ Abbasi Mosque or Imam Mosque after the Iranian revolution of 1979, is a mosque in Isfahan, Iran, standing in the south side of Naghsh-e Jahan Square. Built during the Safavid Empire, ordered by Shah Abbas I. It is regarded as one of the masterpieces of Iranian architecture and an excellent example of Islamic era architecture of Iran. It is registered, along with the Naghsh-e Jahan Square, as a UNESCO World Heritage Site. Its construction began in 1611, and its splendor is mainly due to the beauty of its seven-colour mosaic tiles and calligraphic inscriptions. In 1598, when Shah Abbas decided to move the capital of his Persian empire from the northwestern city of Qazvin to the central city of Isfahan, he initiated what would become one of the greatest programmes in Persian history; the complete remaking of this ancient city. By choosing the central city of Isfahan, fertilized by the Zāyandeh River (“The life-giving river”), lying as an oasis of intense cultivation in the midst of a vast area of arid landscape, he both distanced his capital from any future assaults by Iran’s neighboring arch rival, the Ottomans, and at the same time gained more control over the Persian Gulf, which had recently become an important trading route for the Dutch and British East India Companies. The chief architect of this colossal task of urban planning was Shaykh Bahai (Baha’ ad-Din al-`Amili), who focused the programme on two key features of Shah Abbas’s master plan: the Chahar Bagh avenue, flanked at either side by all the prominent institutions of the city, such as the residences of all foreign dignitaries, and the Naqsh-e Jahan Square (“Exemplar of the World”). 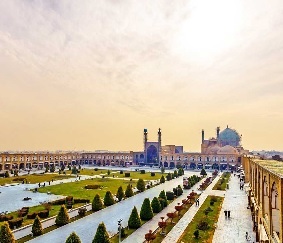 The ingenuity of the square, or Maidān, was that, by building it, Shah Abbas would gather the three main components of power in Persia in his own backyard; the power of the clergy, represented by the Masjed-e Shah, the power of the merchants, represented by the The Imperial Bazaar, and of course, the power of the Shah himself, residing in the Ali Qapu Palace. Allāhverdi Khan Bridge popularly known as Si-o-seh pol (“The bridge of thirty-three spans”) is one of eleven bridges in Isfahan and the longest bridge on the Zayandeh River with the total length of 297.76 metres (976.9 ft). It is one of the most famous examples of Safavid bridge design. Built in 1599–1602, the construction was financed and supervised by Allahverdi Khan Undiladze, chancellor of Shah Abbas I, an ethnic Georgian. It consists of two superimposed rows of 33 arches. 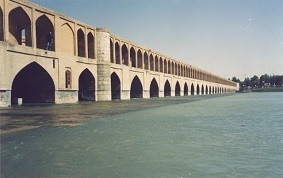 There is a larger base plank at the start of the bridge where the Zayandeh River flows under it. This supports a tea house which nowadays is abandoned due to drought which some claim is due to government mismanagement. Sheikh Lotfollah Mosque is one of the masterpieces of Iranian architecture that was built during the Safavid Empire, standing on the eastern side of Naghsh-i Jahan Square, Esfahan, Iran. Construction of the mosque started in 1603 and was finished in 1619. It was built by the chief architect Shaykh Bahai, during the reign of Shah Abbas I of Persia. Reza Shah Pahlavi ordered to rebuild and repair the mosque in 1920s. Of the four monuments that dominated the perimeter of the Naqsh-e Jahan Square, this one was the first to be built. The purpose of this mosque was for it to be a private mosque of the royal court, unlike the Shah Mosque, which was meant for the public. For this reason, the mosque does not have any minarets and is of a smaller size. Indeed, few Westerners at the time of the Safavids even paid any attention to this mosque, and they certainly did not have access to it. It wasn’t until centuries later, when the doors were opened to the public, that ordinary people could admire the effort that Shah Abbas had put into making this a sacred place for the ladies of his harem, and the exquisite tile- work, which is far superior to those covering the Shah Mosque. To avoid having to walk across the Square when getting to the mosque, Shah Abbas had the architect build a tunnel spanning across the piazza, from the Ali Qapu Palace, to the mosque. Hasht Behesht meaning “Eight Paradises” is a Safavid era palace in Isfahan, Iran. In architecture Hasht-Behesht refers to a specific type of floorplan common in Persian architecture whereby the plan is divided into 8 chambers surrounding a central room. The eight divisions and frequent octagonal forms of such structures represent the eight levels of paradise for Muslims. Chehel Sotoun is a pavilion in the middle of a park at the far end of a long pool, in Isfahan, Iran, built by Shah Abbas II to be used for his entertainment and receptions. In this palace, Shah Abbas II and his successors would receive dignitaries and ambassadors, either on the terrace or in one of the stately reception halls. The name, meaning “Forty Columns” in Persian, was inspired by the twenty slender wooden columns supporting the entrance pavilion, which, when reflected in the waters of the fountain, are said to appear to be forty. As with Ali Qapu, the palace contains many frescoes and paintings on ceramic. Many of the ceramic panels have been dispersed and are now in the possession of major museums in the west. They depict specific historical scenes such as the infamous Battle of Chaldiran against the Ottoman Sultan Selim I, the reception of an Uzbek King in 1646, when the palace had just been completed; the welcome extended to the Mughal Emperor, Humayun who took refuge in Iran in 1544; the battle of Taher-Abad in 1510 where the Safavid Shah Ismail I vanquished and killed the Uzbek King. A more recent painting depicts Nader Shah’s victory against the Indian Army at Karnal in 1739. There are also less historical, but even more aesthetic compositions in the traditional miniature style which celebrate the joy of life and love. The Chehel Sotoun Palace is among the 9 Iranian Gardens which are collectively registered as one of the Iran’s 21 registered World Heritage Sites under the name of the Persian Garden. The Āmeri House is a historic house in Kashan, in Isfahan Province, in Iran. 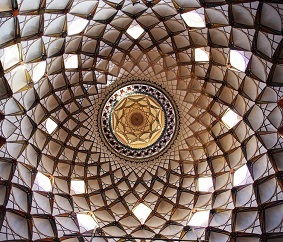 It was built during the Zand era for Āghā ‘Āmeri, the governor of Kashan, who was responsible for maintaining the security of the route between Tehran and Kerman. Covering an area of 9,000 square metres (97,000 sq ft), and housing seven courtyards, the Āmeri house is one of several large spectacular old houses in the central district of Kashan. Like the other houses around it, it was rebuilt in the 19th century, after the city was ravaged by a series of massive earthquakes in the 18th century. 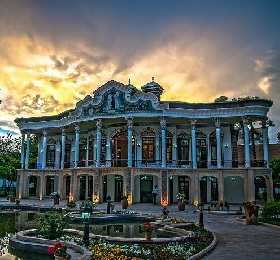 The house is now a public museum, and is protected by Iran’s Cultural Heritage Organization. Vakil Mosque covers an area of 8,660 square meters. It has only two iwans instead of the usual four, on the northern and southern sides of a large open court. 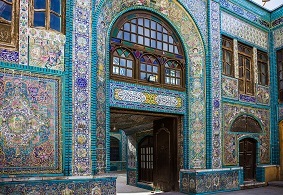 The iwans and court are decorated with typical Shirazi haft rangi tiles, a characteristic feature of the art and industry of Shiraz during the latter half of the 18th century. Its night prayer hall (Shabestan), with an area of approximately 2,700 square meters, contains 48 monolithic pillars carved in spirals, each with a capital of acanthus leaves. The minbar in this hall is cut from a solid piece of green marble with a flight of 14 steps and is considered to be one of the master pieces of the Zand period. The exuberant floral decorative tiles largely date from the Qajar period. Fin Garden located in Kashan, Iran, is a historical Persian garden. It contains Kashan’s Fin Bath, where Amir Kabir, the Qajarid chancellor, was murdered by an assassin sent by King Nasereddin Shah in 1852. Completed in 1590, the Fin Garden is the oldest extant garden in Iran. The settlements of the garden in its present form was built under the reign of Abbas I of Persia (1571-1629), as a traditional bagh near the village of Fin, located a few kilometres southwest of Kashan. The garden was developed further during the Safavid dynasty, until Abbas II of Persia (1633-1666). It was highly recognized during the reign of Fat′h Ali Shah Qajar and was considerably expanded.Unesco declared the garden a World Heritage Site on 2012. The garden covers 2.3 hectares with a main yard surrounded by ramparts with four circular towers. In keeping with many of the Persian gardens of this era, the Fin Garden employs a great many water features. These were fed from a spring on a hillside behind the garden, and the water pressure was such that a large number of circulating pools and fountains could be constructed without the need for mechanical pumps. The garden contains numerous cypress trees and combines architectural features of the Safavid, Zandiyeh and Qajar periods. Sultan Amir Ahmad Bathhouse, also known as the Qasemi Bathhouse, is a traditional Iranian public bathhouse in Kashan, Iran. 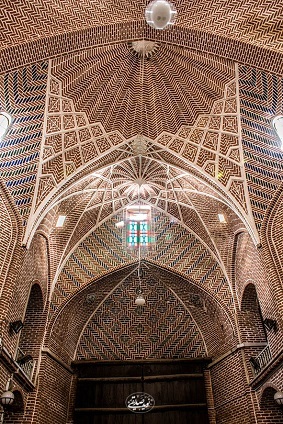 It was constructed in the 16th century, during the Safavid era; however, the bathhouse was damaged in 1778 as a result of an earthquake and was renovated during the Qajar era. 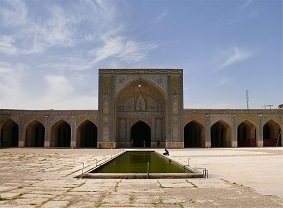 The bathhouse is named after Imamzadeh Sultan Amir Ahmad, whose mausoleum is nearby. 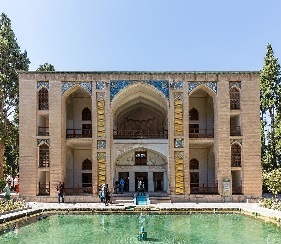 Sultan Amir Ahmad Bathhouse, with an area of around 1000 square meters, consists of two main parts, Sarbineh (the dressing hall) and Garmkhaneh (the hot bathing hall). Sarbineh is a large octagonal hall, which has an octagonal pool in the middle separated by 8 pillars from the outer section. There are four pillars in Garmkhaneh, which make smaller bathing rooms all around as well as the entrance section to Khazineh (final bathing room) in the middle. 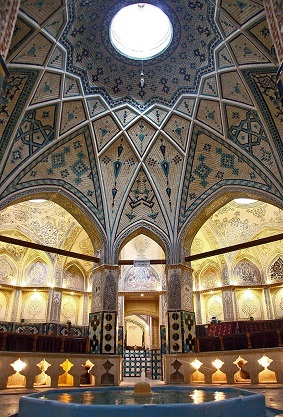 The interior of the bathhouse is decorated with turquoise and gold tilework, plasterwork, brickwork as well as artistic paintings. The roof of the bathhouse is made of multiple domes that contain convex glasses to provide sufficient lighting to the bathhouse while concealing it from the outside. The Tabātabāei House is a historic house in Kashan, Iran. It was built in the early 1880s for the affluent Tabatabaei family. 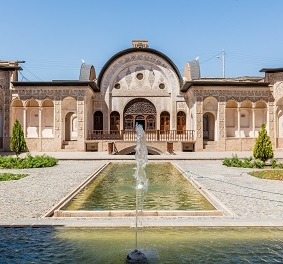 It consists of four courtyards, wall paintings with elegant stained glass windows, and includes other classic features of traditional Persian residential architecture, such as biruni and andaruni. It was designed by Ustad Ali Maryam, architect of the Borujerdis House and the Timcheh Amin od-Dowleh. The house is almost 5,000 square meters and has been very well renovated. The interior yards have beautiful gardens. The house has 40 rooms,4 courtyards,4 basements and 3 windwards. Nehchir Citadel is a historical building located near the city of Mobarakeh in Isfahan Province. The structure dates back to the Safavid era, and has been restored during the Qajar period. The citadel was constructed in an area of 20,000 square metres and has a carpet area of 7,500 square metres. There are four pigeon towers in its four corners. In the old days, the place was used as a station to secure the roads, as well as a central place for local people to do daily shopping. Bazaar of Kashan is an old bazaar in the centre of the city of Kashan, Iran. It is thought to have been built in the Seljuk era with renovations during the Safavid period. It was destroyed in an earthquake and the current buildings were mostly built during the Ghajar period. 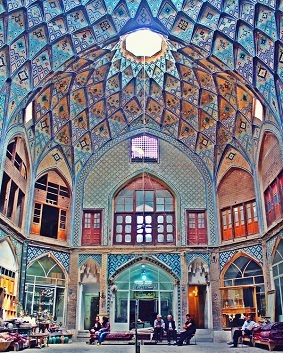 The bazaar has a famous architecture, especially at its Timche-ye Amin od-Dowleh section, where a grand light well was built in the 19th century. The bazaar is still in use and is a few miles in total length. In the bazaar’s complex beside the main bazaars, there are several mosques, tombs, caravanserais, arcades, baths, and water reservoirs that each were constructed in a different period. Agha Bozorg mosque is a historical mosque in Kashan, Iran. The mosque was built in the late 18th century by master-architect Ustad Haj Sa’ban-ali. The mosque and theological school (madrasah) is located in the center of the city. Agha Bozorgh Mosque was constructed for prayers, preaching and teaching sessions held by Molla Mahdi Naraghi II also known as Mulla Mohammad Naraqi, known famously by his title of Āghā Bozorgh (literally meaning big or great lord) given to him by the Shah himself. Molla Mahdi Naraghi II was the son of the legendary Mulla Ahmad Naraqi (also spelled sometimes as Naraghi) who was the second strongest person in Iran after the king himself, Fath-Ali Shah Qajar. The mosque has been described as “the finest Islamic complex in Kashan and one of the best of the mid-19th century”. Noted for its symmetrical design, it consists of two large iwans, one in front of the mihrab and the other by the entrance. The courtyard has a second court in the middle which comprises a garden with trees and a fountain. 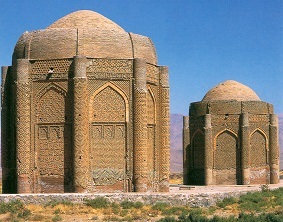 The iwan in front of mehrab has two minarets with a brick dome. It was here where Ustad Ali Maryam as a pupil started his career as an architect. The Borujerdi House is a historic house in Kashan, Iran. The house was built in 1857 by architect Ustad Ali Maryam, for the wife of Seyyed Mehdi Borujerdi, a wealthy merchant. The wife came from the affluent Tabatabaei family, which Seyyed Mehdi fall in love with her and built this house for her. It consists of a rectangular beautiful courtyard, delightful wall paintings by the royal painter Sani ol molk, and three 40 meter tall wind towers which help cool the house to unusually cool temperatures. 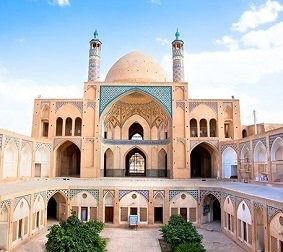 It has 3 entrances, and all the classic signatures of traditional Persian residential architecture, such as a biruni yard (exterior yard) and a daruni yard (interior yard). The house took eighteen years to build using 150 craftsmen. Tekyeh Moaven al-molk is in Kermanshah city of Iran. It was constructed during Qajar era as a Shia mourning site. In 1975 Tekyeh Moaven al-molk recognized as a National monument. it is well known for its exclusive tilings picturing Islamic era warriors, Battle of Karbala and pictures of Iranian kings. This site has 3 main parts: Hussainiya Zaeynabiya and Abbasiya. 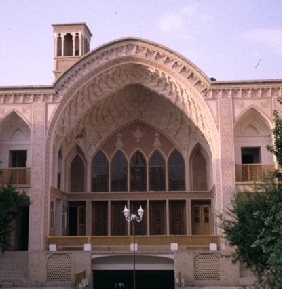 Museum of Anthropology of Kermanshah and Clothes and Jewelry Museum of Kermanshah. Shush Castle is located in the ruins of the ancient city of Susa (Shush) in the Khuzestan Province of Iran. It was constructed by French archaeologist Jean-Marie Jacques de Morgan in the late 1890s, as a secure base for archaeological exploration and excavation. The structure was built by local craftsmen with bricks taken from two other archaeological sites, the Achaemenid Darius/Dariush castle and the Elamite Choqazanbil ziggurat. It is built atop a hill (“tappeh”) which may contain other relics of past times. It is an example of the pre-scientific era of archaeology, when explorers mutilated or destroyed sites in the process of examining them. The former French government property was taken over by the Islamic Republic after the Iranian Revolution in 1979. It is now used as a museum. Its best-known holding is a cuneiform tablet inscribed with the Code of Hammurabi, however this is now on display in the Louvre Museum in Paris, France.The castle was heavily damaged by Iraqi bombs during the recent Iran–Iraq War, but has since been completely restored by the Iranian government. 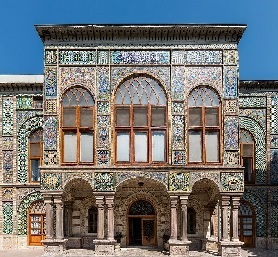 The Golestan Palace is the former royal Qajar complex in Iran’s capital city, Tehran. One of the oldest historic monuments in the city of Tehran, and of world heritage status, the Golestan Palace belongs to a group of royal buildings that were once enclosed within the mud-thatched walls of Tehran’s arg (“citadel”). It consists of gardens, royal buildings, and collections of Iranian crafts and European presents from the 18th and 19th centuries. Tehran’s arg (“citadel”) was built during the reign of Tahmasp I (1524–1576) of the Safavid dynasty (1502–1736), and was later renovated by Karim Khan of the Zand dynasty (1750-1779). Agha Mohammad Khan of the Qajar dynasty (1742–1797) chose Tehran as his capital. The arg became the seat of the Qajars (1794–1925). 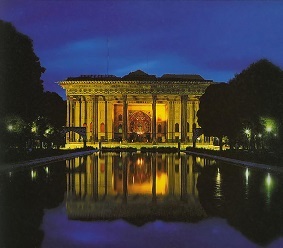 The court and palace of Golestan became the official residence of the Qajar dynasty. The palace was rebuilt to its current form in 1865 by Haji Ab ol Hasan Mimar Navai. 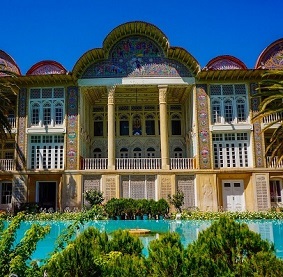 During the Pahlavi era (1925–1979), the Golestan Palace was used for formal royal receptions, and the Pahlavi dynasty built their own palace (the Niavaran Complex) in Niavaran. The most important ceremonies held in the palace during the Pahlavi era were the coronation of Reza Shah (1925-1941) on the Marble Throne and the coronation of Mohammad Reza Pahlavi (1941-1979) in the Museum Hall. In between 1925 and 1945, a large portion of the buildings of the complex were destroyed on the orders of Reza Shah. He believed that the centuries-old Qajar palace should not hinder the growth of a modern city. In the place of the old buildings, commercial buildings with the modern style of 1950s and 1960s were erected. Qavam House (also widely called “Narenjestan of Ghavam”) is a traditional and historical house in Shiraz. It was built between 1879 and 1886 by Mirza Ibrahim Khan. The Qavam family were merchants originally from Qazvin. But they soon became active in the government during the Zand dynasty, followed by the Qajar, and Pahlavi dynasty as well. The Qavam “Naranjestan” preserves the elegance and refinement enjoyed by the upper-class families during the 19th century. The paintings on the low ceilings of the house are inspired by Victorian era Europe. The mirrored porch was a focal point of the house, overlooking a small garden that was designed with fountains, date palms, and flowering plants. 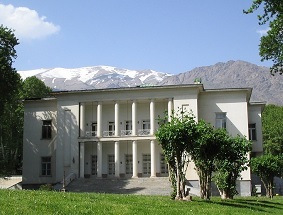 During the second Pahlavi era, the House became the headquarters of Pahlavi University’s Asia Institute, directed by Arthur Upham Pope and Richard Nelson Frye. Frye and his family also lived in the house for a while. The house today is a museum and is open to the public. The National Garden (Bāgh-e Melli) is a historical and governmental compound in Tehran, Iran. Formerly referred to as the Parade Square (Meydān-e Mašq), it used to be a military shooting range during the Qajar period. It was then turned into a public park for a short period, and eventually important governmental offices and museums were built around it. The Ministry of Foreign Affairs (formerly the “Police House”), the University of Art (formerly the “Cossack House”), Malek National Museum, Post and Communication Museum, and the National Museum are situated in the compound. The field was first constructed during the reign of the Qajar Dynasty. It was used for the military garrison, and the Cossacks practiced military parade in it. The range was then developed during the reign of Nasser ed Din Shah, with a new building named Cossack House, which was somewhat transformed during the reign of Mozaffar ed Din Shah. Under the rule of Reza Shah of the Pahlavi Dynasty, the range was turned into a modern public park for a short period, and the famous gate of the compound was built by Mirza Mehdi Khan Shaghaghi (Momtahen od Dowle) before the arrival of World War II. 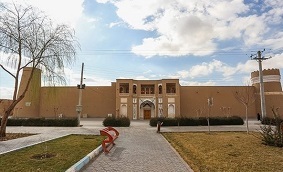 Eventually, important governmental buildings were built around the compound; such as the “Police House” (or the “Shahrbani House”) which was built for Shahrbani, an organization responsible for maintaining security in the city. The Sa’dabad Complex is a 300 hectare complex built by the Qajar and Pahlavi monarchs, located in Shemiran. Today, the official residence of the President of Iran is located adjacent to the complex. The complex includes more than 180 hectares of natural forest, streets, qanats, galleries, and museums. 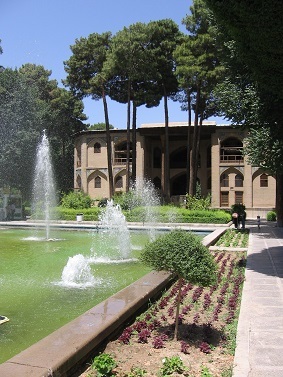 The complex was first built and inhabited by Qajar monarchs in the 19th century. After an expansion of the compounds, Reza Shah of the Pahlavi Dynasty lived there in the 1920s, and his son, Mohammad Reza Pahlavi, moved there in the 1970s. After the 1979 Revolution, the complex became a museum. Currently, parts of the complex are museums, which visitors can roam through. The complex is operated by the Cultural Heritage Organization of Iran which is responsible for most of the artifacts, locations, and cultural aspects of the country. Shapouri House or Shapouri Pavilion and Garden is an early 20th-century Persian building and garden in the city of Shiraz, Iran. It has 840 square metres of underpinning and 4635 square metres of garden area. 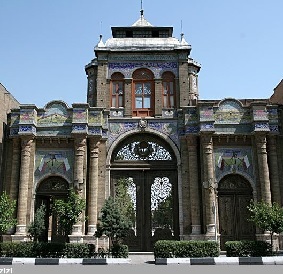 This building is in the old central region of Shiraz, known as Anvari. This mansion was registered as a national building in 2000. Shapouri mansion was designed by Abolghasem Mohandesi and built between 1930 and 1935; the owner was Abdolsaheb Shapuori. This building is unique and very innovative. Bank Melli Iran (lit. National Bank of Iran) is the first national Iranian bank. The bank was established in 1927 by the order of the Iranian Majlis (the Iranian Parliament) and since then has consistently been one of the most influential Iranian banks. It is one of the oldest buildings associated with Iran National Bank and was built in 1927 by a German architect. Designed by Hooshang Seyhoun, it was built in 1952, replacing an older building dedicated to Avicenna which was destroyed in 1950. The Iranian government had plans to build the mausoleum since at least 1939. The mausoleum was eventually dedicated in a grand ceremony in May 1954, and the avenue running in front of it was also renamed in honor of Avicenna. 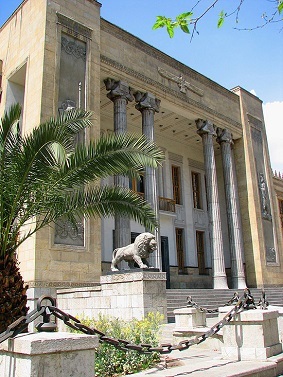 The Senate of Iran was the upper house legislative chamber in Iran from 1949 to 1979. A bicameral legislature had been established in the 1906 Persian Constitutional Revolution but the Senate was not actually formed until after the Iran Constituent Assembly, 1949, as an expression of Shah Mohammad Reza Pahlavi’s desire for more political power. The Senate was filled mainly with men who were supportive of the Shah’s aims, as intended by Pahlavi. The Senate was disbanded after the “Islamic Revolution” in 1979, when the new constitution established a unicameral legislature. As of 2015 the former Senate building was used by the Assembly of Experts. 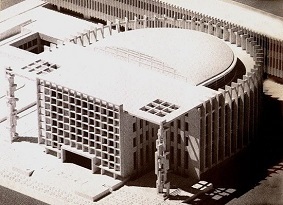 The Senate House of Iran was designed by architect Heydar Ghiaï in 1955. The construction was led by Rahmat Safai, the dome being one of the most technically challenging projects in the entire endeavour. Tehran Museum of Contemporary Art is among the largest art museums in Iran. It has collections of more than 3000 items that include 19th and 20th century’s world-class European and American paintings, prints, drawings and sculptures. TMoCA also has one of the greatest collections of Iranian modern and contemporary art. The museum was inaugurated in 1977 and is considered to have the most valuable collections of modern Western masterpieces outside Europe and North America. 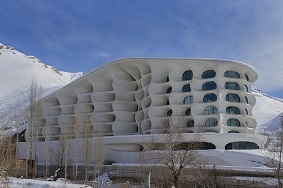 The museum was designed by Iranian architect Kamran Diba, who employed elements from traditional Persian architecture. It was built adjacent to Laleh Park. Most of the museum area is located underground with a circular walkway that spirals downwards with galleries branching outwards. 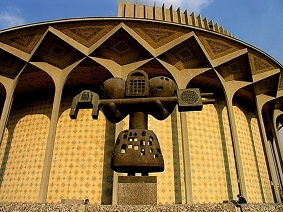 The City Theater (Teātr-e Šahr) is a performing arts complex in Tehran. It was built with the initiative of Queen Farah Pahlavi. It contains several performance spaces including the halls of Charsou, Qashqai, Saye, and the main hall. It also houses a specialist library for the arts. 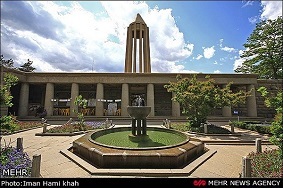 The complex was designed by architect Ali Sardar Afkhami (a student of Hooshang Seyhoon) in the 1960s and opened in 1972. The design was inspired by Tughrul Tower. 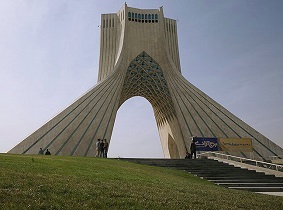 The Azadi Tower (Borj e Āzādi; “Freedom Tower”), formerly known as the Shahyad Tower (Borj e Šahyād; “King’s Memorial Tower”), built in 1971 is a monument located at Azadi Square, in Tehran, Iran. It is one of the landmarks of Tehran, marking the west entrance to the city, and is part of the Azadi Cultural Complex, which also includes a museum underground. The tower is about 45 meters (148 ft) tall and is completely clad in cut marble. It was commissioned by Mohammad Reza Pahlavi, the last shah of Iran, to mark the 2,500th year of the foundation of the State of Iran. After winning a competition, architect Hossein Amanat was tasked to design the tower. His ideas were based upon classical and post-classical Iranian architecture and popular influences on art in the 1960s. 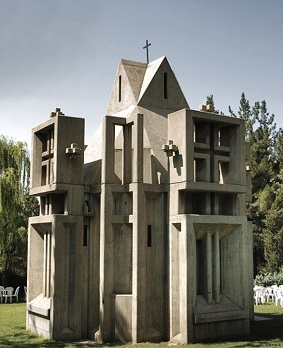 Surp Khatch Chapel in Tehran holds a peculiar significance within Armenian-Iranian life. There are many Armenian churches within Iran, mostly in Tehran and the western provinces. 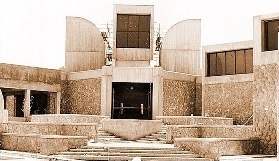 Surp Khatch was built in 1986 by Rostom Voskanian in 1987 in part to memorialize the thousands of Armenian service members killed in the Iran-Iraq War. 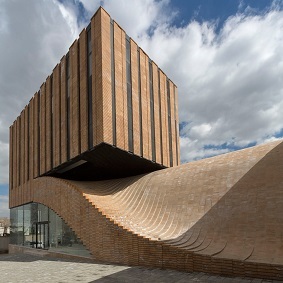 The brick facade of this mixed-use building in the Iranian city of Hamedan merges with a wave-like roof that the public is invited to sit, walk or play on. The Termeh building was designed by architects Farshad Mehdizadeh and Ahmad Bathaei to accommodate two separate occupants and two distinct functions: a retail space on the ground floor and an office on the level above. It is designed to connect with the city’s public realm and is influenced by Hamedan’s many public squares, which are linked by wide boulevards. One of these boulevards runs along one edge of the building, so the architects decided to emphasise the connection between the interior and the street by bringing the roof down to meet the pavement. 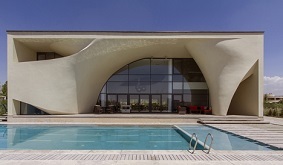 The building is titled after the traditional handwoven Iranian cloth Termeh, which is evoked by the undulating form. Local bricks laid in traditional patterns match the facades found on many buildings in the neighbourhood. 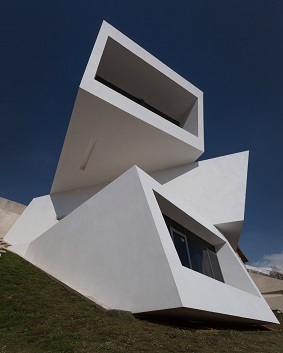 A trio of volumes are stacked one on top of each other to form this hillside residence near Tehran by New Wave Architecture, but each one is angled towards a different view. The Iranian practice designed Mosha House for a structural engineer and his family, for a steeply sloping plot facing the Alborz mountain range. To make the most of the scenery surrounding the elevated site, the architects devised three single-storey blocks with glazed ends that frame vistas of both the peaks and the Mosha plain below. The concrete block are stacked irregularly so that they form cantilevers. All three blocks are painted white, giving them a distinctive appearance in the setting. The aim was to create a sense of “purity”, according to the team. The volumes have a collective floor area of 260 square metres. Inside, they include two generous bedrooms, an indoor swimming pool and a timber-lined sauna. “The intense topography and the location between mountains with views to flat plain of Mosha, inspired us to create a sense of suspension and wide views for all spaces,” said the architects. 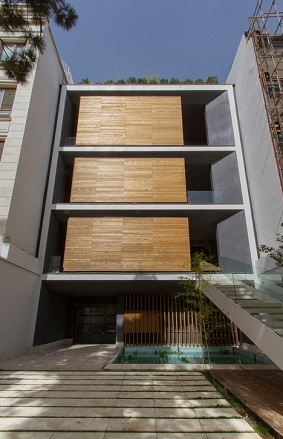 Swivelling pods allow the owners of this house in Tehran to adapt to Iran’s fluctuating temperatures by opening up rooms in summer, or turning them inwards during winter. Designed by Tehran studio Next Office, Sharifi-ha House features three rooms that can be rotated 90 degrees to open up views and terraces during Iran’s hot summers, and turned back to a horizontal position to keep the house warmer during the cold, snowy winters. “The openness and closure of the building is a reference to traditional Iranian houses, which offer both a winter and a summer living room,” said architect Alireza Taghaboni of Next Office, whose previous projects include a concrete house with a sweeping curved facade. “Like many urban plots, this one had a noticeably narrow facade-width compared with its depth. Consequently, our expertise in transforming a two-dimensional facade to a three-dimensional one became indispensable,” said Taghaboni, who redesigned plans 16 times for the client throughout the course of the project. The three pods house a breakfast room on the first floor, a guest room on the second floor, and a home office on the third floor. Each one features a door at the side that provides access to the terrace when they are turned open, and access to the house when they are closed. “The house adapts to the functional needs of its users,” said Taghaboni. “The guest room can be reconfigured for different purposes. Similarly, the home office and breakfast room can change the formality of their appearance according to their residents’ desires.” The motorised turntables that the pods rest on were made by Germany company Bumat, using a system that theatre sets and car exhibitions also rely on. Terraces had to be designed with foldable balustrades that tilt up or down as the pods are being rotated, to accommodate the changeable facade. 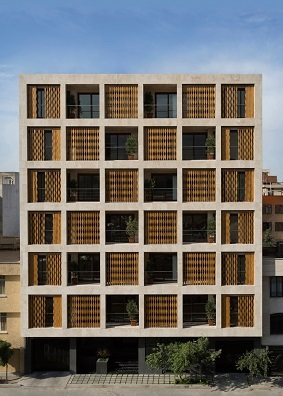 Wooden shutters can be drawn across the pigeonhole-style windows of this apartment block in Tehran by local studio TDC Office. Studio founders Sara Kalantary and Reza Sayadian created the eight-storey block known as Saba in response to the “change in people’s lifestyle, development of the cities and the increasing demand for constructing high-rise buildings” in the Iranian capital. The street-facing facade comprises blocks of light-coloured stone and features a grid of recessed windows, which are covered by slats of wood with wavy edges. Set vertically on rails in front of floor-to-ceiling windows, these individual pieces of shuttering can be arranged by hand depending on the owners need for light, privacy or views – a technique also used by Ayeneh Office for its ridged granite housing block in the city. But Kalantary and Sayadian feel this high-rise lifestyle has obliterated the connection between home and garden, so wanted to reestablish the connection. This project was the result of our efforts in revitalising this lost heritage and giving a new interpretation to the old concept,” they said. “Which we believe one of the main reasons of the cultural crisis our society is engaged with nowadays is the result of this abrupt shift in the living space.” The building’s garden-facing facade is made from locally sourced brick and features the same grid of windows as the street frontage. Each of the building’s six uppermost floors features four apartments – two at the front and two at the rear – while the lower levels are used for car parking. This arrangement gives each resident access to a private outdoor area. 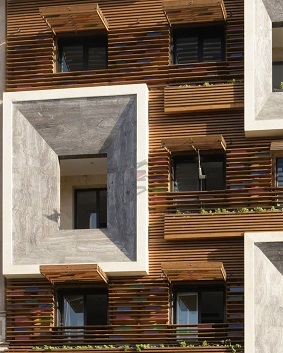 Faceted window frames project from the slatted timber and stained-glass facade of this apartment block in Tehran, designed by Iranian studio Keivani Architects. Brothers Nima and Sina Keivani based the design of the seven-storey block on elements commonly found in traditional Iranian architecture. The architects particularly wanted to reinterpret the orsi window, a type of sash window with latticed woodwork and coloured glass typically used to help reduce sunlight and heat, and repel insects in the hot climate. This inspired the project name Orsi Khaneh. The street-facing facade is made from a double layer of heat-treated timber, inset with panes of stained glass and planting that not only serve as a decorative element but also help to control temperature. Matching slatted sunshades can be raised over the windows to provide further control of sunlight. The appearance is in part inspired by a pair of historic residences with intricately moulded and patterned facades – Borujerdis House and Tabātabāei House, located in the Iranian city of Kashan. 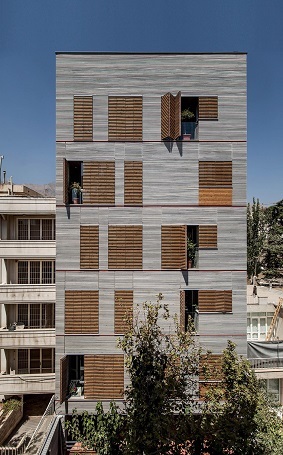 Slatted timber shutters provide privacy and shade for this Tehran apartment block by local firm Ayeneh Office, and line up with its ridged granite facade. Andarzgoo Residential Building was designed by Ayeneh Office for a site near Andarzgoo Boulevard – a lively, upmarket area in the north of the Irani capital. The block stands on a narrow alley near other buildings of varying heights and materials, so the architects in charge Ali Dehghani, Ali Soltani and Atefeh Karbasi chose to give it a simple, restrained exterior. “The adjacent buildings have been chaotically constructed, so we created a neutral, formless facade to give the alley a calmer quality,” they said. “Our strategy was primarily focused on the avoidance of a complex presentation.” The six-storey building has a small car park on the ground floor, and one apartment on each of the floors above. There is also a basement housing a gym, mechanical rooms and storage. Local zoning rules prevented the architects from adding balconies at the front of the building, so they inserted deep glazed recesses into each apartment instead, which provide internal terraces, and bring light and ventilation into the living spaces. The five apartments each have an open-plan living space and dining area at the front, and three bedrooms and two bathrooms at the north-facing back, which are arranged in a C-shape around a void to ensure they get adequate daylight. “We placed the private areas at the back, and the communal areas along the main facade, which faces south-west, to invite sunlight inside the main living space,” explained the architects. The five apartments each have an open-plan living space and dining area at the front, and three bedrooms and two bathrooms at the north-facing back, which are arranged in a C-shape around a void to ensure they get adequate daylight. “We placed the private areas at the back, and the communal areas along the main facade, which faces south-west, to invite sunlight inside the main living space,” explained the architects. This cafe in the Iranian capital is designed to act as a semi-public venue in the city, where open gathering spaces are starting to become popular again after years of heavy policing. The cafe in Tehran’s Mirdamad neighbourhood was designed by Sanaz Ghaemmaghami and Mojtaba Zaheri of local studio Modaam Architects for the Amir Chocolate coffee shop chain. “In a megalopolis like Tehran the public sphere gradually fades, affected by political and social factors,” said the architects. “The Amir Chocolate + Urban Cafe is an attempt to create public space in the heart of Tehran’s dense urban context.” The cafe features a removable glass frontage that allows the interior to extend onto the adjacent pavement. These glass partitions are fixed to a track in the ceiling so they can be entirely removed to one side or set back to form a screen that exposes part of the interior to the street.Boxy planters surrounding the bases of trees outside the Amir Chocolate + Urban Cafe offer suitable perches so guests can eat and drink at tables set out on the pavement. According to the architects, this sort of al fresco experience is still rare in Tehran. 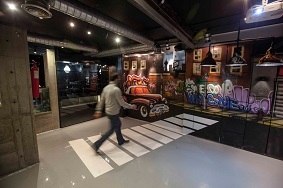 A graffiti mural applied to one wall of the cafe depicts a typical urban scene, featuring a road, automobile and a glimpse of the city’s Milad Tower. When viewed from the correct angle, a striped pedestrian crossing painted on the floor appears to continue into the painted scene, creating an illusion of depth within the space. Billowing curves sweep across the concrete facade and continue inside this house near Tehran, designed by Iranian studio Next Office. Kouhsar Villa in Kordan, Iran, was already partly built when the owner approached Next Office to redesign it. His brief was to open the house up by removing an octagonal void in the centre, which offered little connection with the surrounding landscape. Rather than tear the central void’s steel columns down, the redesign has covered them with a continuous curved wall, which extends outside to cover the southern facade. The architects cut openings into this curved structure to connect the central void to the surrounding rooms, and also cut through the floors above to create double-height spaces. An assortment of different pathways encourage pedestrians to “wander and get lost” on this bridge in Tehran, designed by Iranian architect Leila Araghian. Araghian’s studio Diba Tensile Architecture completed the 270-metre-long Tabiat Bridge at the end of 2014, five years after winning a design competition. 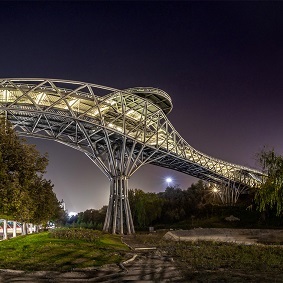 It is currently the largest pedestrian bridge in Iran, connecting Abo Atash Park on the west to Taleghani Park on the east, across a busy highway. The structure comprises three levels that follow a curved path, and which are connected by various ramps and stairs. This ten-storey resort is located near Shemshak ski resort, the second largest ski resort in Iran and in only half an hour drive from the capital. This location is defined by Snow-covered landscapes, so the architects didn’t want the building to be indifferent about its surrounding, but as a part of nature embracing that. The Barin Ski resort picks up on the philosophy of designing buildings so that the form emulates the immediate environment in a fluid way. Barin ski resort looks one with the snow-covered mountain, almost as if windswept onto the mountain side, like an iced rock formation. The individuals rooms, 67 in total, each in a different size, from 45m studio flat to 270m penthouse, seem carved into a mountainous ice block like natural caves. Each cell which is in dome shape enhances the feeling of a warm, homely ‘cave’ to relax in after skiing out in the cold. The continuation of this design approach inside the rooms and corridors, which also have organically formed, as well as the pebble shaped windows that offer stunning views of the surrounding mountain range, all these factors make the Barin Ski Resort a holistic building that complements its natural habitat.